We went on our first post-Natal burger excursion today. As you can see from the picture, Nate geared up for his first adventure by resting up. He also napped through the whole lunch, too. We, including our guest burger judge, Dan, tried Southwell’s today. We ended up there after realizing that all the burger places we really wanted to try (Lankford Grocery, Bellaire Broiler Burger, Christian’s Totem) are closed on Sundays. Dan had suggested Barnaby’s, but, as I’ve described before, Barnaby’s doesn’t qualify for “best burger” status. Southwell’s receives mixed reviews in web searches, but it had enough positive comments to call it a contender. An important note, before I describe the Southwell’s burgers: we decided today to implement a 3-thumbs rating system. Each of us will rate each burger with a yes, no, or half thumb. Retroactively, we’ve given Prince’s 1.5 thumbs and Pappas BBQ 1 thumb. A restaurant has to receive 3 thumbs to be a contender for the best burger in Houston. Southwell got 2.5 thumbs, making it the best burger so far. The buns were nothing special, and they were very mashed down on the grill, although they tasted good. The patties were thin, but tasted good, and the fries were like In-N-Out fries, well-done (i.e., very good). In fact, all in all, Southwell’s was really the closest to In-N-Out that I’ve come across in Houston. (So you Californians will have to try it when you come visit…) The cheese was very high quality, and despite some pickle-clumping issues on my burger, the condiments were well-applied. What I learned from the Southwell’s trip is that a thicker patty is one of my criteria for a really good burger. The thin patties just get too dried out. The burgers and fries were very good at Southwell’s, but it’s really not a contender for the best burger in Houston. Apparently, the quest for an elusive burger is not ours alone (mine, Dan’s, and my mom’s, I mean). I previously mentioned that our gold standard was from a bar in Empire, MI, which we don’t know the name of and definitely couldn’t find again if we wanted to. The exact same story line formed the plot of the September 29 episode of How I Met Your Mother. I guess it must be a common experience to have had an amazing burger someplace and then never be able to find it again. Dan has dubbed this “Burgerdoon”. For those who are wondering, the burger reporting has somewhat been put on hold with the arrival of Nathan and the new school year. Nate will definitely accompany us on future research, but those visits now have to wait for my mom to have a school break or something. Good burger places are just too crowded on weekends to conduct research then. I just want to get out ahead of this, since there are rumors going around about what and who’s going to be in the next Batman movie. Dan, Kelly, and I were discussing the next installment after we took in The Dark Knight for a second time (but, hey, who’s counting?). I think the Riddler would be an excellent villain in keeping with the Christopher Nolan philosophy of realistic, gritty Batman. He could be a Hannibal Lecter-type serial killer who toys with the police and thinks of Batman as his only worthy adversary. That’s all fine, although I think Johnny Depp is too OTT for the Nolan Batman universe. I’ve never seen him do anything with subtlety. Depp is great as Jack Sparrow, but he fits the Tim Burton Batman, not the Nolan one, and Tim Burton already had his shot at the Batman franchise. That leaves these persistent rumors about the Penguin. The consensus when we were talking about this was that the Penguin is too weird and cartoony to be featured in a Nolan Batman movie. This is why, in fact, the writers of the current Batman franchise have said in interviews that they don’t want to bring in Penguin or Catwoman for their series. The only plausible way the three of us could come up with for introducing Penguin was if he was a mob boss whose nickname, maybe even behind his back (like “Harvey Two-Face”), was the Penguin. Maybe because he has a limp, maybe because he only wears tuxedos, I don’t really care (and I’m willing to loan those ideas to the Batman franchise, for some slight recognition). But it has to stay realistic. Who’s the Chosen One, again? Who wants to be a Republican? After watching Rudy Giuliani’s and Sarah Palin’s speeches last night, I have to wonder. I didn’t hear substantive arguments or positive plans; I heard negative, mocking speeches from both of them. Now, I didn’t watch or read Joe Biden’s speech at the Democrats’ convention, so maybe he took on the attack dog role that both Giuliani and Palin seemed to revel in last night for the Republicans. But I did watch Hillary Clinton’s and Bill Clinton’s and part of Al Gore’s and all of Barack Obama’s speeches last week. I didn’t hear them mocking John McCain, calling him essentially just a stuffed shirt, claiming that he’s the creation of Hollywood, and so forth. Hillary Clinton’s speech was the most direct, saying that John McCain is not what we need and will take the country in a direction we don’t want to go, but even she didn’t make ad hominem attacks. In fact, almost all of Giuliani’s and Palin’s criticisms were ad hominem, whereas the Democrats were very careful to remain respectful of John McCain throughout their convention. It’s these sorts of speeches that make me actively hate the Republican party and wonder who actually considers himself a Republican. Apparently, we can’t have disagreements or discussions or debates in politics. Apparently, at least as the Republicans would have it, we have to belittle and attack and ridicule each other. The fact that the Democrats don’t do that, at least not at the level of the leaders of the party, causes the Republicans to call them wimps. I’d rather belong to the party of wimps than the party of bullies. It seems that it was, in fact, handball, not to be confused with (American) handball. Do we not have enough sports these days, without creating new ones by taking existing sports and changing their rules slightly? This seemed like a mash up of soccer and basketball: “It’s soccer, but you can carry the ball, and it’s played indoors;” “It’s basketball, only you don’t have to dribble … unless you want to. And the net’s on the ground.” I’m left with the impression that the best way to legitimize your otherwise-stupid sport is to petition to get it included in the Olympics. Dan speculates that the Olympics is now home to sports previously relegated to The Ocho. 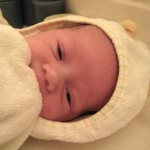 Nathan now has his own blog, complete with pictures and anecdotes. Dan and I both will be updating over there, although I reserve the right to make parenting-related posts here still, too. Note 1: Upon leaving The Dark Knight on Saturday, I noted my appearance in the bathroom mirror. As I rejoined Dan on the way out, I commented that I must be a mom now, because no one else would think a hot pink shirt went with a baby blue cardigan. And yet the perpetual juxtaposition of pink and blue in baby hospital garb has totally inured me to it. Note 2: Nathan’s getting ready to move from his bassinet to his crib, because he yesterday demonstrated his ability to roll entirely onto one side, which brings his face perilously close to the padded bassinet side. This is fine with us, because his bassinet is haunted. Starting Saturday morning, the various parts of the bassinet began turning themselves on without human intervention. My mom and I were out in the living room, talking, and had the bassinet out with us (Nathan was not in it), when the mobile started going around and its music started playing. When Dan got home from his conference, we mentioned it to him, and he was skeptical. But again, while we were talking about it, I asked, “Is the vibration going?” Sure enough, my mom stepped over to it and put her hand down and jumped back, saying, “Yes!” Dan was convinced enough to posit that we are part of the plot of Stephen King’s Bassinet, and we’ve had to do a hard shut-down at the switch to stop it entirely, so it doesn’t creep us out overnight. 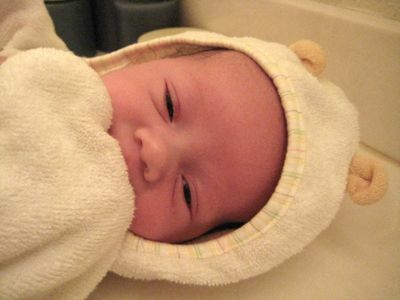 Note 3: Babies look cute in Pooh Bear bath wraps. I’ve been noticing that all the fountain soda I have consumed lately has tasted terrible. Basically, every mix seems to be off in the direction of too little carbonation and too much syrup. This is a particularly sad joke on me, because I’d really laid off all soda while pregnant. Because of my risk for gestational diabetes (which I didn’t get), I stayed away from soda with corn syrup, and because of the lack of research on the effects of artificial sweeteners on fetuses, I didn’t consume diet sodas either. Now that I’m not pregnant anymore, I was working some back into my diet, although less than before, because I was proud of myself for having somewhat kicked the habit. Imagine my sadness, then, that all the sodas I’ve had post-pregnancy have been terrible. I even indulged in a Coke — my first Coke in over a year! — at the movies on Saturday, and it, too, was flat. Since this has been happening everywhere I’ve gotten soda lately, I’m wondering whether all the distributors or retail outlets are changing their mixes. Is the syrup less expensive than the carbonation? I’m chalking it up to the bad economy. I have no other explanation. I realized after the movie that my relationship to movies has fundamentally changed, now that I have a child. Movies are now an escape from reality for me. I don’t mean that in the traditional way in which movies are often characterized as escapism, i.e., that movies function as vehicles for imagination that let the viewer identify with the characters and try on different psychological personas for awhile. I mean it quite literally: a movie is an opportunity to escape parenthood for a little while. Up until now, Dan and I went to the movies willy-nilly. It was almost a hobby for us. If we had nothing else to do on a weekend, we’d go see a movie. We didn’t even care if it was a good movie or not. On more than one occasion, I’ve remarked that I’d be willing to pay $6 a week just to watch previews and eat popcorn. I liked going to the movies just for the sake of going to the movies. Suddenly, however, going to the movies is a huge luxury. It has to be planned out. It’s not something we’ll be doing very frequently, and it certainly won’t be wasted on any old movie. When we walked out of the movies on Saturday, I realized that I had been a different person for the 2.5 hours we were in there. 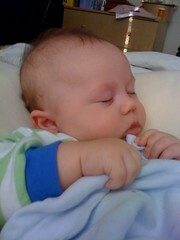 For 2.5 hours, I was not the mommy tied to Nathan’s eating schedule, home-bound because of C-section recovery. Instead, I was still a person who can go to the movies when she wants to. It was a huge relief; I felt like a normal human for the first time in, oh, about three weeks.